Engineered for maximum durability and long life with impact drivers. Forged, so they fit fasteners more precisely, which reduces stripping and increases the life of the bit. Manufactured with heavy-duty, cold-forged, high grade steel to withstand extremely high torque output. Black oxide finish resists corrosion. Used in high torque power tools; for use in power drill chuck and chuck adapter; 1/4" hex shank. Used in high torque power tools; for use in power drill chuck and chuck adapter; 1/4" hex shank. Used in high torque power tools; for use in power drill chuck and chuck adapter; 1/4" hex shank. Specially designed to reduce stripping. Heat treated to resist breakage and wear. Made of shock resistant tool steel for maximum durability. Hardened core for extra strength and reduced breakage. Specially designed to reduce stripping. Heat treated to resist breakage and wear. Made of shock resistant tool steel for maximum durability. Hardened core for extra strength and reduced breakage. Specially designed to reduce stripping. Heat treated to resist breakage and wear. Made of shock resistant tool steel for maximum durability. Hardened core for extra strength and reduced breakage. Specially designed to reduce stripping. Heat treated to resist breakage and wear. Made of shock resistant tool steel for maximum durability. Hardened core for extra strength and reduced breakage. Made of shock resistant tool steel; 1/4" hex shank. Specially designed to reduce stripping. Heat treated to resist breakage and wear. Made of shock resistant tool steel for maximum durability. Hardened core for extra strength and reduced breakage. High performance for metal, wood, deck and drywall applications. Specially designed to reduce stripping. Heat treated to resist breakage and wear. Made of shock resistant tool steel for maximum durability. Hardened core for extra strength and reduced breakage; 1/4" hex shank. Engineered for maximum durability and long life with impact drivers. Forged, so they fit fasteners more precisely, which reduces stripping and increases the life of the bit. Manufactured with heavy-duty, cold-forged, high grade steel to withstand extremely high torque output. Black oxide finish resists corrosion. Dewalt Insert Bit, Series: FlexTorq, NO 2 Point, Phillips Point, 1 in Overall Length, Hexagonal Shank, 1/4 in Shank, Magnetic Screw Locking, S2 Modified Steel, For Impact Drivers Dewalt Insert Bit, Series: FlexTorq, NO 3 Point, Phillips Point, 1 in Overall Length, Hexagonal Shank, 1/4 in Shank, Magnetic Screw Locking, S2 Modified Steel, For Impact Drivers S2 tool steel construction with a Rockwell Hardness between 58-62 for strength and precise fit; quick, easy change-out in production use; 1/4" hex shank. 2 per package. Used in high torque power tools; for use in power drill chuck and chuck adapter; 1/4" hex shank. Used in high torque power tools; for use in power drill chuck and chuck adapter; 1/4" hex shank. Geometric design provides the shock absorption zone. Proprietary steel and heat treat process for maximum strength and durability. Forged tip allows for a secure grip and maximum contact eliminating stripping or slipping. Geometric design provides the shock absorption zone. Proprietary steel and heat treat process for maximum strength and durability. Forged tip allows for a secure grip and maximum contact eliminating stripping or slipping. Geometric design provides the shock absorption zone. Proprietary steel and heat treat process for maximum strength and durability. Forged tip allows for a secure grip and maximum contact eliminating stripping or slipping. Universal chuck key holder attaches your chuck key directly to your drill cord to help keep it where you need it. 30252 Fits most brands of 1/4", and 3/8" chuck keys; 30253 is universal. Black rubber. Dewalt Insert Bit, Series: FlexTorq, NO 2 Point, Phillips Point, 1 in Overall Length, Hexagonal Shank, 1/4 in Shank, Magnetic Screw Locking, S2 Modified Steel, For Impact Drivers Made of shock resistant tool steel; Not for use in bit holders or Quick-Change chuck adapters; 1/4" hex shank. Made of shock resistant tool steel; Not for use in bit holders or Quick-Change chuck adapters; 1/4" hex shank. For use in driving screws and other fasteners by hand tool application or with corded or cordless drills; 1/4 " hex shank Geometric design provides the shock absorption zone. Proprietary steel and heat treat process for maximum strength and durability. Forged tip allows for a secure grip and maximum contact eliminating stripping or slipping. Geometric design provides the shock absorption zone. Proprietary steel and heat treat process for maximum strength and durability. Forged tip allows for a secure grip and maximum contact eliminating stripping or slipping. Engineered for extreme durability. Made from proprietary steel and heat treated to control hardness. Geometric design provides shock absorption zone to extend life. The forged tip allows for a secure grip and maximum contact, eliminating stripping or slipping. Includes: (1) Phillips Shockwave power bit; 1/4'' diameter. Performance-optimized S2 steel construction for extended life. Ideal for driving screws in a variety of heavy duty applications including metal fastening, deck building, framing, and installing plywood subfloor. For use with high torque impact drivers and driver-drills. Includes: (2) ImpactX #2 Phillips bits. Xtended Torsion Zone to absorb high-torque of new impact drivers. Precision engineered for a tighter fit and less cam-out. Heat-treated manufacturing for stronger bit. High visibility sleeve with laser etched markings for user convenience. 2" overall length. 10X life over standard impact bits. High-visibility sleeve with laser-etched markings for user convenience. Xtended Torsion Zone to absorb high-torque of new impact drivers. Precision engineered for a tighter fit and less cam-out. Heat-treated manufacturing for stronger bit. High visibility sleeve with laser etched markings for user convenience. 2" overall length. Xtended Torsion Zone to absorb high-torque of new impact drivers. Precision engineered for a tighter fit and less cam-out. Heat-treated manufacturing for stronger bit. High visibility sleeve with laser etched markings for user convenience. Contains (1) Impact Tough 1" Phillips Square No 2 Insert Bits. Dewalt Insert Bit, Series: FlexTorq, NO 2 Point, Phillips Point, 2 in Overall Length, Hexagonal Shank, 1/4 in Shank, Magnetic Screw Locking, S2 Modified Steel, For Impact Drivers For impact drills and drivers. Engineered for maximum durability and long life with impact drivers. Fit fasteners more precisely, which reduces stripping. Manufactured with heavy-duty, cold-forged, high grade steel to withstand high torque output. Black oxide finish resists corrosion. Tempered steel for increased durability. Ribbed tip withstands up to 50 percent more torque before camout. Proven sub-zero tempering process gives these bits long life and increased durability. For impact drills and drivers. Engineered for maximum durability and long life with impact drivers. Fit fasteners more precisely, which reduces stripping. Manufactured with heavy-duty, cold-forged, high grade steel to withstand high torque output. Black oxide finish resists corrosion. Soft steel handle limits potential for dangerous fracturing under excessive loads. Industrial deck bit tip that is shock resistant steel for maximum durability, hardened core for extra strength and reduced breakage, heat treated to resist breakage and wear and specially designed to reduce stripping; 1/4" hex shank. Used in high torque power tools; for use in power drill chuck and chuck adapter; 1/4" hex shank. For impact drills and drivers. Engineered for maximum durability and long life with impact drivers. Fit fasteners more precisely, which reduces stripping. Manufactured with heavy-duty, cold-forged, high grade steel to withstand high torque output. Black oxide finish resists corrosion. For impact drills and drivers. Engineered for maximum durability and long life with impact drivers. Fit fasteners more precisely, which reduces stripping. Manufactured with heavy-duty, cold-forged, high grade steel to withstand high torque output. Black oxide finish resists corrosion. For impact drills and drivers. Engineered for maximum durability and long life with impact drivers. Fit fasteners more precisely, which reduces stripping. Manufactured with heavy-duty, cold-forged, high grade steel to withstand high torque output. Black oxide finish resists corrosion. Geometric design provides the shock absorption zone. Proprietary steel and heat treat process for maximum strength and durability. Forged tip allows for a secure grip and maximum contact eliminating stripping or slipping. Engineered for extreme durability. Made from proprietary steel and heat treated to control hardness. Geometric design provides shock absorption zone to extend life. The forged tip allows for a secure grip and maximum contact, eliminating stripping or slipping. Includes: (1) Phillips Shockwave power bit; 1/4'' diameter. Specially designed to reduce stripping. Heat treated to resist breakage and wear. Made of shock resistant tool steel for maximum durability. Hardened core for extra strength and reduced breakage. Soft steel handle limits potential for dangerous fracturing under excessive loads. Engineered to be the more durable and better fitting. The optimized shock zone geometry is unique for each tip type to provide longer life and absorb 3 times more torque. Geometric design provides the shock absorption zone. Proprietary steel and heat treat process for maximum strength and durability. Forged tip allows for a secure grip and maximum contact eliminating stripping or slipping. Made of shock resistant tool steel; 1/4" hex shank. Geometric design provides the shock absorption zone. Proprietary steel and heat treat process for maximum strength and durability. Forged tip allows for a secure grip and maximum contact eliminating stripping or slipping. Soft steel handle limits potential for dangerous fracturing under excessive loads. Bosch Power Screwdriver Bit, NO 2 Point, Phillips, P2 Point, 1 in Overall Length, Hexagonal Shank, 1/4 in Shank, Steel, Black Oxide, Impact Tough Hardness, For Impact Driver Soft steel handle limits potential for dangerous fracturing under excessive loads. Specially designed to reduce stripping. Heat treated to resist breakage and wear. Made of shock resistant tool steel for maximum durability. Hardened core for extra strength and reduced breakage. Shock resistant tool steel has advanced hardening process. Soft steel handle limits potential for dangerous fracturing under excessive loads. Soft steel handle limits potential for dangerous fracturing under excessive loads. Shock resistant tool steel has advanced hardening process. Impact Ready accessories deliver exceptional performance for extreme torque applications. FlexTorq bits feature an extended FlexTorq zone to transfer optimal torque in hard joint applications, providing durability and longer life. The bit tip is CNC machined for a precise fit. Magnetic Screw Lock sleeve minimizes drops and reduces wobbles. Impact ready bits with flextime have increased durability and long life. Single end. Impact rated. Drive Size: 6. Overall Length: 6". Point Size: No 2. Point Type: Phillips. Shank Size: 1/4". Magnesium Phosphate finish. Shock-resistant tool steel for maximum durability with a hardened core for extra strength and reduced breakage; 1/4" hex shank; 3 pieces. 6'' power bits are engineered for extreme durability and long life. Made from proprietary steel and heat treated to control hardness. The forged tip allows for a secure grip and maximum contact, eliminating stripping or slipping. Ideal for heavy duty impact applications for all drilling and fastening needs. Includes P2 Phillips Shockwave 6'' power bit. Industrial deck bit tip that is shock resistant steel for maximum durability, hardened core for extra strength and reduced breakage, heat treated to resist breakage and wear and specially designed to reduce stripping; 1/4" hex shank. DoubleLok technology ensures both ends of bit lock securely in impact drivers and quick-change chucks, enabling use of two tips from one bit for added convenience and extended life. Precision tip geometry delivers superior fitment, reducing stripping and cam-out. Power groove designed for compatibility with Irwin Impact Performance series Magnetic Screw Hold Attachment. Manufactured with Heavy-duty, cold forged high-grade steel to withstand high torque output. #2PH. 2-3/8" overall length. Used for depth control when drilling with twist and brad point drill bits. Made of cold rolled steel with black oxide finish. Includes (1) one each: 3/16", 1/4", 5/16", 3/8", 7/16", 1/2", hex wrench and reusable snap blister. Made to handle tough torque applications withstands up to 50 percent more torque before slipping. Ribbed tips, fully hardened and tempered steel for increased durability; universal 1/4" hex shank. Includes: (10) ten standard #2 bits and plastic case. Dewalt Insert Bit, Series: FlexTorq, NO 2 Point, Phillips Point, 1 in Overall Length, Hexagonal Shank, 1/4 in Shank, Magnetic Screw Locking, S2 Modified Steel, For Impact Drivers Specially designed to reduce stripping. Heat treated to resist breakage and wear. Made of shock resistant tool steel for maximum durability. Hardened core for extra strength and reduced breakage. Made from nickel-plated steel and used for accurate match and transfer of dowel holes. Includes: (2) two each: 1/4", 5/16", 3/8? and 1/2". Geometric design provides the shock absorption zone. Proprietary steel and heat treat process for maximum strength and durability. Forged tip allows for a secure grip and maximum contact eliminating stripping or slipping. Made of shock resistant tool steel; 1/4" hex shank. Made of shock resistant tool steel; 1/4" hex shank. Made of shock resistant tool steel; 1/4" hex shank. Made of shock resistant tool steel for maximum durability with hardened core for extra strength and reduced breakage in applications such as metal, wood, deck and drywall; 1/4" hex shank. Specially designed to reduce stripping. Heat treated to resist breakage and wear. Made of shock resistant tool steel for maximum durability. Hardened core for extra strength and reduced breakage. Impact double-ended power bits with precision tip. Provides better fit with less stripping. For use with models DA3000 and DA3000R right angle drills, or 6000LR, 6510LVR, 6000R, DA3000R, HP1030. For heavy duty impact, drilling and fastening use. Geometric design provides the shock absorption zone. Forged tips for maximum grip. Drill Gage is a useful guide for identifying drill bit sizes; extremely helpful when working with older, unmarked drill bits, as well as with bits that are too small to fit diameter markings. Measures bits from 1/16" to 1/2" x 64ths metric range from .062 to .500mm; made from heavy duty stainless steel with black etched graduations. Double ended Phillips bit set with Magnetic screw hold attachment. DoubleLok technology ensures both ends of bit lock securely in impact drivers and quick-change chucks, enabling use of two tips from one bit for added convenience and extended life. Precision tip geometry delivers superior fitment, reducing stripping and cam-out. Power groove designed for compatibility with Irwin Impact Performance series Magnetic Screw Hold Attachment. Manufactured with Heavy-duty, cold forged high-grade steel to withstand high torque output. Includes: (3) #2PH/#2PH and attachment. Double ended square bit set with Magnetic screw hold attachment. DoubleLok technology ensures both ends of bit lock securely in impact drivers and quick-change chucks, enabling use of two tips from one bit for added convenience and extended life. Precision tip geometry delivers superior fitment, reducing stripping and cam-out. Power groove designed for compatibility with Irwin Impact Performance series Magnetic Screw Hold Attachment. Manufactured with Heavy-duty, cold forged high-grade steel to withstand high torque output. Includes: (3) #2SQ/#2SQ and attachment. Made of high-grade S2 tool steel and milled for precise fit. Specifically built for the higher torque requirements of power tools; can be used with drill chuck or quick change chuck adapter in applications such as appliance, automotive, aviation, decking, drywall, electronics, furniture assembly, general construction and HVACR; 1/4" hex shank. Made of shock resistant tool steel; 1/4" hex shank. The hole sizes and decimal equivalents are permanently etched on face so they won't wear off with repeated use. Number size drills 61 to 80. Fractional size drills 1/16" to 1/2" x 64ths. Metric range from .062 to .500mm. This gage has been crafted to meet government specifications. CNC machined bit tip for precise fit in screw heads for reducing cam-out. Magnetic Screw Lock sleeve minimizes drops and reduces wobbles. Extended FlexTorq zone transfers optimal torque for durability and a longer life. 2" shank length. Size: No 2. Milwaukee Shockwave Impact Duty driver bits are engineered to be more durable and better fitting. The optimized ShockZone geometry is unique for each type to provide up to 30 times longer life and absorbs 3 times more torque. The Precise Fit custom machined tip prevents stripping and reduce wobble, while the Custom Alloy76 Steel and proprietary heat treat process maximizes resistance to wear and shock. Built to deliver extreme durability for the most demanding applications. Made of high-grade S2 tool steel and milled for precise fit. Specifically built for the higher torque requirements of power tools; can be used with drill chuck or quick change chuck adapter in applications such as appliance, automotive, aviation, decking, drywall, electronics, furniture assembly, general construction and HVACR; 1/4" hex shank. Made of high-grade S2 tool steel and milled for precise fit. Specifically built for the higher torque requirements of power tools; can be used with drill chuck or quick change chuck adapter in applications such as appliance, automotive, aviation, decking, drywall, electronics, furniture assembly, general construction and HVACR; 1/4" hex shank. Made of high-grade S2 tool steel and milled for precise fit. Specifically built for the higher torque requirements of power tools; can be used with drill chuck or quick change chuck adapter in applications such as appliance, automotive, aviation, decking, drywall, electronics, furniture assembly, general construction and HVACR; 1/4" hex shank. For tighter access with your current Impact driver. Magnet secures fastener. 1/4" shank. Unique revolving turret design is extremely accurate and simple to use for end to end, edge to edge or edge to end doweling. Accepts 6 sizes of twist bits: 3/16", 1/4", 5/16", 3/8", 7/16" and 1/2". Guide bars are graduated for fast positioning of hole center. Used to making fast, accurate dowel holes in furniture and other carpentry applications. Includes: three (3) brad point drill bits: 1/4", 5/16" and 3/8", 30 dowel pins: ten (10) of each 1/4", 5/16" and 3/8", (3) three drill stops: 1/4", 5/16" and 3/8", (8) eight dowel centers (2) two each: 1/4", 5/16", 3/8" and 1/2", 1 hex wrench, craft glue. Specially designed to reduce stripping. Heat treated to resist breakage and wear. Made of shock resistant tool steel for maximum durability. Hardened core for extra strength and reduced breakage. You can adjust the Drill Guide in 5 degree increments from 0-45 degrees, left and right. V-Guides for drilling through rounded stock or dowel, positive stop for accurate drill depth and centering channel on base for edge drilling. Attaches to all 3/8" and 1/2" power drills. Folds for tool-box storage. Contains 12 genuine Dremel Saw-Max cutting wheels. Gives you all of the accessories needed for making simple cuts through a wide range of materials. Allows the user to cut through wood, plastic, drywall, laminates, metals, brick, tile and more. Set includes: (1) SM600 wood and plastic flush-cut wheel, (2) SM500 wood and plastic cutting wheels, (1) SM540 tile diamond wheel, (2) SM520 masonry cut-off wheels and (6) SM510 metal cut-off wheels. Includes reusable storage case. Compact attachment measures 2" wide, allowing it to fit in tight, difficult to reach places. Durable all metal housing and steel gears with ball bearing construction allows the adapter to handle up to 235 in-lbs of torque. Allows you to drive screws and drill bits in tight, difficult work areas. For use with cordless drills; convenient quick change chuck accepts standard 1/4" hex drive accessories, Milwaukee Shockwave Impact Duty driver bits are engineered to be more durable and better fitting. The optimized ShockZone geometry is unique for each type to provide up to 10 times longer life and absorbs 3 times more torque. The Precise Fit custom machined tip prevents stripping and reduce wobble, while the Custom Alloy76 Steel and proprietary heat treat process maximizes resistance to wear and shock. Built to deliver extreme durability for the most demanding applications. Turns any drill into an angle drill. Fits into drill chuck like you would use a drill bit. Use in hard to reach areas with drill bits, wire brushes, polishers and grinding discs. Completely sealed, never needs lubricating. Not for use in hammer drills. Includes: Jacobs 3/8" chuck Thin kerf, 103", saw blade designed to cut through ferrous metals quickly and accurately leaving clean, burr free cuts. Used for cutting steel studs, steel pipe and steel sheet. For most mild steels under 1/8" thick. Used for crosscutting oak, pine, malamine, plywood and moulding. TCG tooth design, .090" plate, -2 degree hook angle, 1,800 max rpm. 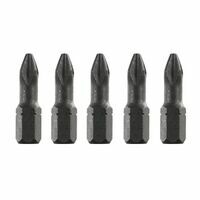 Milwaukee Shockwave Impact duty bits are engineered to be very durable. The optimized Shockzone geometry is unique for each tip to provide longer life and absorb more torque. The precise fit custom machined tip prevents stripping and reduces wobble, while the custom Alloy76 steel proprietary heat treat process maximizes resistance to wear and shock.